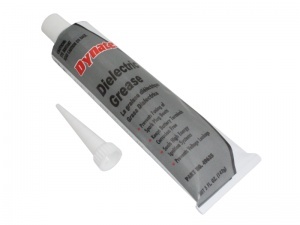 Dynatex dielectric grease can be used on terminals, connectors, HT leads, trailer sockets, multi-way connector blocks, battery posts etc. to prevent moisture ingress, corrosion and shorting between contacts. It's odourless, non-volatile and works in extreme temperatures. Resistant to moisture, air, acids and alkalis. Ideal for use in marine environments. Sold individually in 142g tubes.